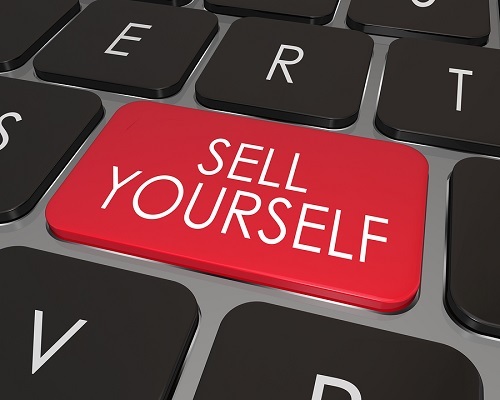 Some entrepreneurs, including some of the most determined and successful, are under the impression that they either don’t have to bother with selling themselves, or that selling yourself is wrong. There is a huge difference between “selling yourself” and “selling out.” Selling yourself is simply marketing your skills and who you are, to both your clients and your organization. Selling out is trading in what makes you unique, like your standards or mission statement, for an immediate dollar or advantage. See the difference? Sometimes entrepreneurs think, “I don’t have to be bothered with selling myself, I’ll let my record do that.” The problem is only people familiar with your story know about your incredible skill set. For the rest of the world, you’ll have to do some “on purpose” marketing. It’s just plain fact that in the business world today, marketing is required. You wouldn’t design, patent and create an awesome product and never advertise it. As long as you never abandon what matters to you, you won’t sell out. Begin by studying your personal mission statement. If you work for an organization, study theirs too. In some cases, you may have to juggle the two a bit to get a clear picture of who you are. 1. Begin keeping a weekly report of what you do. Besides any duties required by your company, good things to include are times you spent mentoring, social work or whatever makes you unique. Put these reports in email or a simple newsletter format. Let the world know what you are doing. Send the people you want to impress a weekly report of what you are doing. Use a blog or a platform like LinkedIn to blog about your industry or profession. Become a thought leader. 3. Update your public profile. Change your bio picture, update your work status on all social media especially. Sell yourself by being current and provide the world with up to date information. When possible, find a way to display your personal creed. 4. Frame your degrees and certifications. What better way to “sell yourself” then to display what you have already achieved? Look for opportunities to join local nonprofit boards and local chamber of commerce committees, and to speak at local civic clubs. Want to win big? You’ll have to risk big. Keep in mind that those who do stupid things without first getting permission can get fired. However, people who achieve brilliant things without getting permission get praised. You’ll have to play the balancing game if you choose this method to sell yourself. You don’t have to negotiate with your principles to stand out in the crowd. With some skill, you can sell your dream, your product, and even yourself without losing anything. Rhett Power co-founded Wild Creations in 2007 and quickly built the company into the fastest-growing business in South Carolina. Learn more at rhettpower.com. ← Is Your Ambition Holding You Back? Can Nigeria’s Growing Population, Be Regarded As A blessing Or A Curse?